Ipswich's Foxhall Road is not one of most pleasant ways to cycle out of town. It narrows as it passes Foxhall Stadium, and the traffic roars past on its way to the dump, or cutting through the back roads to the housing estates of Kesgrave. Eventually, it reaches the A12 bypassing Ipswich to the east, and it is a blessed relief to cross it onto the Waldringfield Road. A narrow lane off to the south takes you down a long, wooded slope, and here, barely a quarter a mile from the A12, is one of the prettiest, most secretive little churches in the Ipswich area. This is a tiny parish, with barely twenty souls on the electoral roll. There isn't really a village, and it is hard to imagine, as you stand in the small graveyard, that a town of 150,000 people can be so close. Externally, St John the Baptist is a bit of a curiosity. The more you look at it, the more interesting it becomes.The body of the church itself is not unfamiliar, a simple 13th century nave without a separate chancel. But the tower that rises from the west end of it is something else again, as are the three pyramid obelisks at the west end. The red brick is common around these parts, but the style is wholly out of keeping with what we have come to expect in Suffolk. This is because St John the Baptist is one of the few churches in England to have been extensively rebuilt during the Commonwealth period of the 1640s and 1650s, when the Church of England was suppressed, and English parish churches were taken over by all kinds of congregationalist sects. Here, there seems to have been a very brave Squire, Thomas Essington, who at the height of the Cromwellian persecution rebuilt the tower, and supported it internally with Tuscan columns and an arcade. The Essington faith was strong; and as well it should be, for the 1650s were a terrible time for the family. Thomas himself died during the rebuilding, in 1656, and his five year old son died the same year. The little boy's memorial in the south wall is pathetic and sentimental, a rare illustration of private grief in those public, fundamentalist days. In 1660, just before the Commonwealth came to an exhausted conclusion, his seventeen year old daughter died; her memorial, to the south of the sanctuary, recalls her to be a gratious virgin. Both memorials claim the final words of the two children; his were Christ will raise mee, and hers were My mortal shell put on immortality. A few weeks later, their mother died. The parents are buried beneath a ledger stone below their children's memorials. 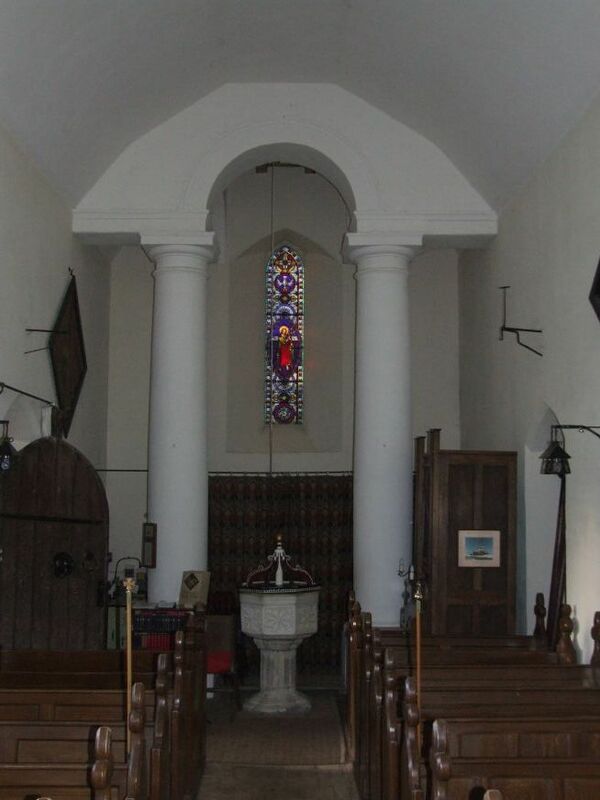 The church is also associated with the Barnadistons, more famously of Kedington. Their hatchments line the walls, along with a memorial to the last of the line. Their vault is in front of the sanctuary, and their armour once decorated the west end, although this has long been taken off to safekeeping somewhere. The font is a fairly typical 14th century example, but the font cover is worth a second glance, because it dates from Essington's 1650s restoration of the church. It was designed to sit beneath those Tuscan columns. By great contrast, the east end of the church is very much f the early 20th century. 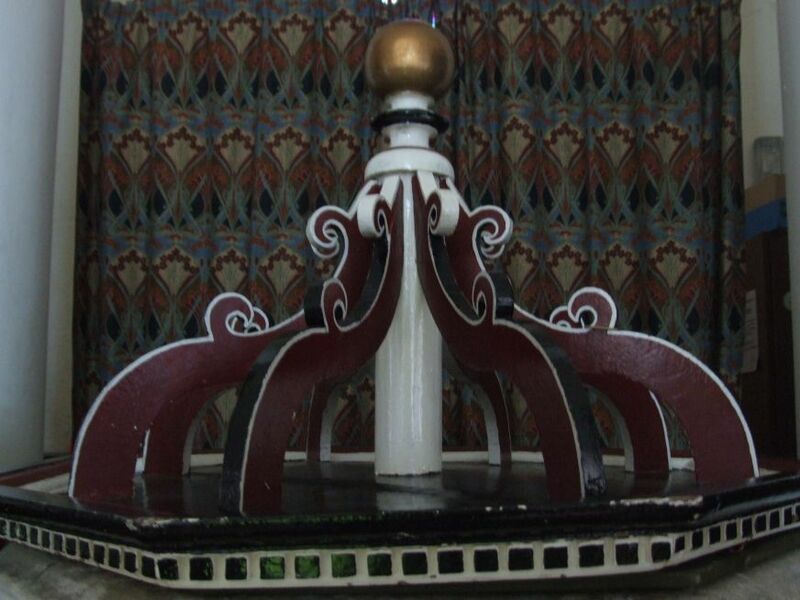 It has been somewhat simplified since I first saw it in 1999, and I was sad to see that the rare English altar with riddel posts and screen has recently been removed. It, and the great, sombre crucifixion which still survives above, were a memoir of a time when this little church on a hill was an Anglo-catholic shrine. 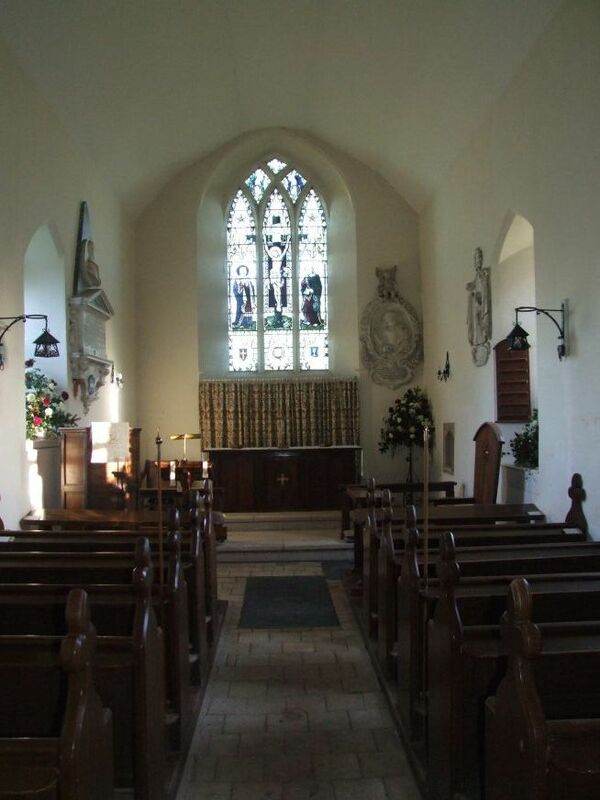 Roy Tricker, the Suffolk church historian, has told me that there are accounts of the celebration of Mass with servers dressed in cottas and red cassocks in the years before the First World War, and the parish had a set of eucharistic vestments given by the Confraternity of the Blessed Sacrament. All long gone, now. 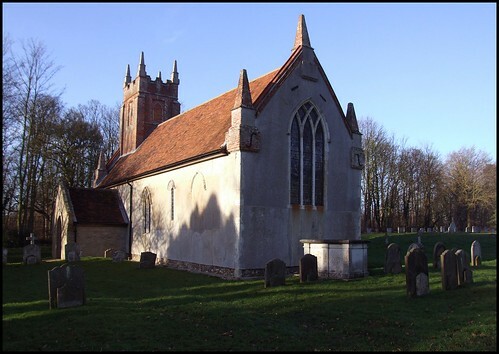 For many years, Brightwell church was open day and night, probably a relic of its Anglo-catholic shrine days, but a loss of nerve in recent years, as well as some vandalism, has meant that the church is now kept locked. There is no keyholder notice, although the friendly Rector is happy to open up. However, it is an awful shame to find it kept locked at a time when more and more churches are making themselves open to strangers and pilgrims. When I had last come here, on a breezy Easter Monday in 2001, the baying of lambs from the fields around was like a challenge to the Foot and Mouth Disease sweeping the rest of the country, leaving East Anglia untouched. No lambs today, in the middle of January 2008, of course, but there was still a feeling of the landscape burgeoning, preparing itself to be born again. I wandered around the tidy graveyard, where much has been cleared away. To the south and east of the church, several 18th and 19th century stones survive, including one featuring a splendid King Death, a jolly grinning skull with crown and wings.